Stems: Erect, softly pubescent with downwardly-directed hairs. Leaves: Opposite, grayish green, long-stalked, blades broadly egg-shaped to nearly circular in outline, deeply palmately 3-parted; divisions narrow, unequal, 2-7 cleft and incised; tips pointed. Inflorescences: Spike-like, composed of dense, whorl-like clusters in leaf axils, 3-10-flowered; leaf-like bracts subtending flowers reduced, deeply lobed into narrow segments or uppermost sometimes lanceolate and entire. Flowers: Calyx tubular, bell-shaped, about 1/4 inch long, 5-10 ribs, 5-lobed; lobes prolonged into stiff, slender spines; corolla 2/5 to 3/5 inch long, rose-pink to purplish, 2-lipped; upper lip entire, hood-like, short-hairy above; lower lip spreading or bent downward, 3-lobed, purple mottled; central lobe longest; stamens 4, ascending under upper lip; lower pair equaling or longer than upper pair; stigma 2-lobed. Fruits: Nutlets 4, less than .1 inch long, 3-angled, top pubescent, each 1-seeded. Habitat: Waste places, open woods, ditches, and along streams. Distribution: Somewhat rare in Kansas, but scattered occurrences in eastern portions of the state. Origin: Native to Asia, introduced and now naturalized. Toxicity: Contact with the leaves causes skin inflammation in some individuals. Uses: Native Americans used the species Leonurus cardiaca, (more commonly found in Kansas), to make a tea taken to treat stomach problems, "female ills", and as a stimulant for fainting. Comments: The common name "motherwort" refers to the plant's use in the past to make a tea given to mothers during child birth. 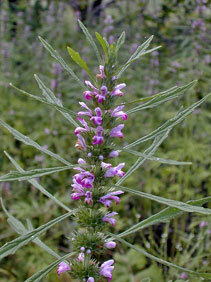 Leonurus is from the Greek leon "lion" and oura "tail", probably in reference to the shape of the mature inflorescence. Grazing animals are sometimes injured by the sharp calyx teeth.